Hello and welcome to my home tour! 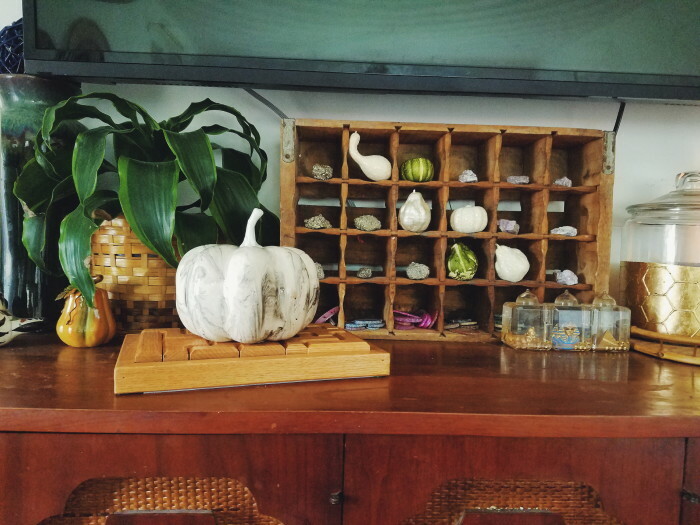 Even with a home mostly torn apart for a dozen or so projects, Fall nesting still has to happen. It's one of those natural progressions throughout the year. 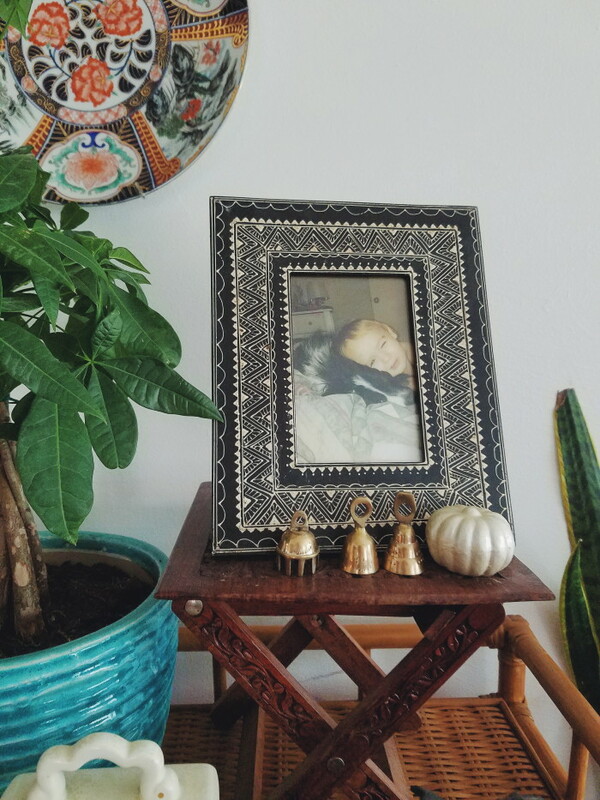 My Fall decorating style is very muted, focusing more on the cozy feeling of a room and little nods to the season sprinkled throughout. 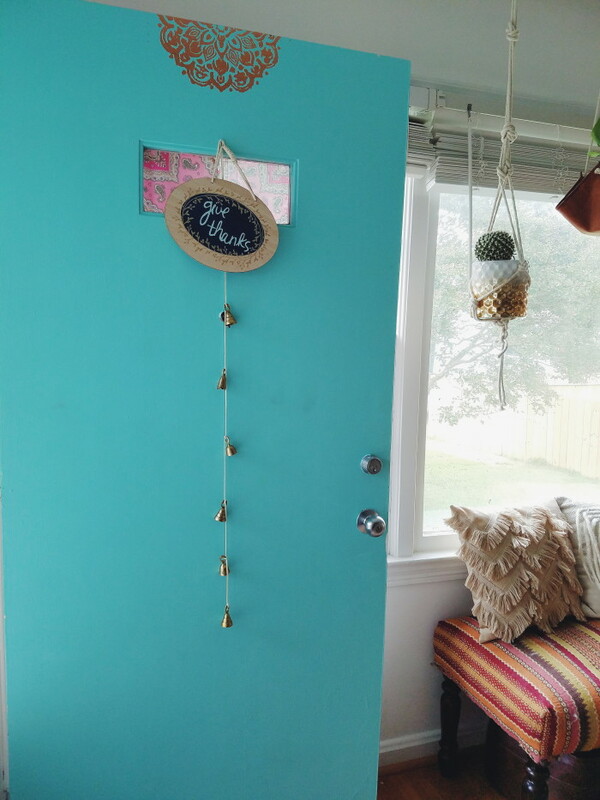 I'm excited to share with you a bit what that looks like for me as part of the Blogger Stylin' Home Tours hosted by Lindsay of The White Buffalo Styling Co. Thank you to those of you stopping by from, Eileen And Co! If you're new here, Hey, What's up? Hello! I'm grateful to have you here today. 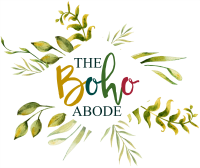 My name is Corinna and I am the editor and creator of this boho abode. 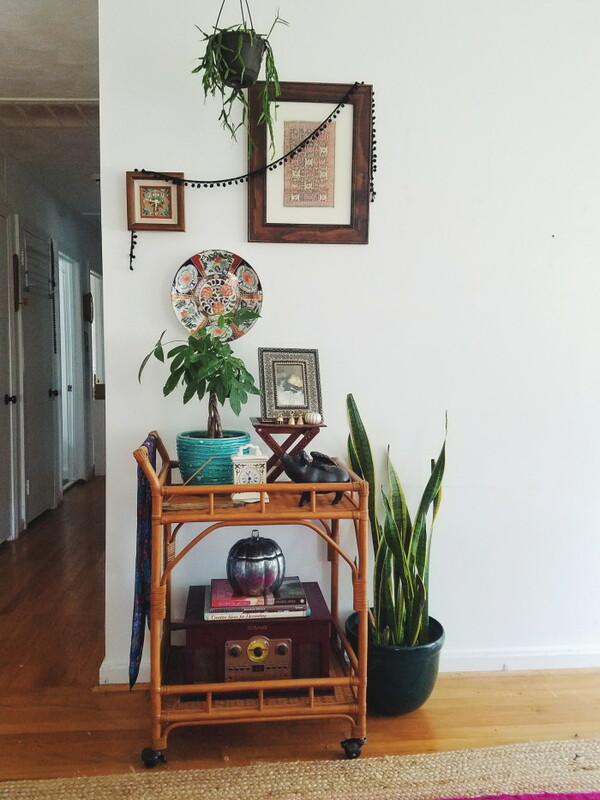 I'm passionate about creating beautiful spaces meant for living. 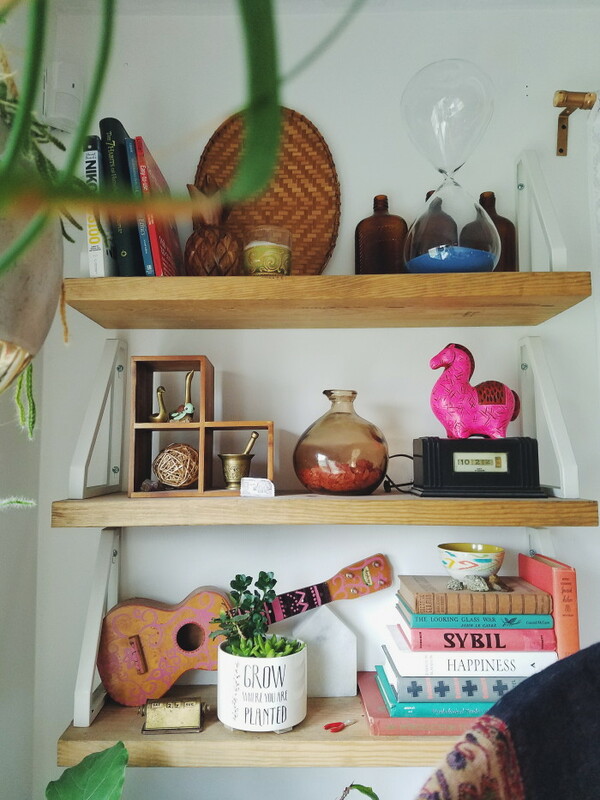 I share my own home's journey, tips for yours, mood boards with shopping lists, my thrifting adventures and full home decorated tours. I love nature, laughter and creating. After you've toured, if you like what you see please follow me on your favorite social media platforms and sign up for email updates! To set the tone for the tour, light up the Leaves Bath and Body Works candle and tune in to 3 gymnopedies (arr. a. miolin): gymnopedie no. 1. This is what you can expect when you walk into my home on most days. Oh, and my little black and white barking fluff will insist he greet you himself and attempt to woo you. You may notice right away that there's no entry way. We're right in the everything space. 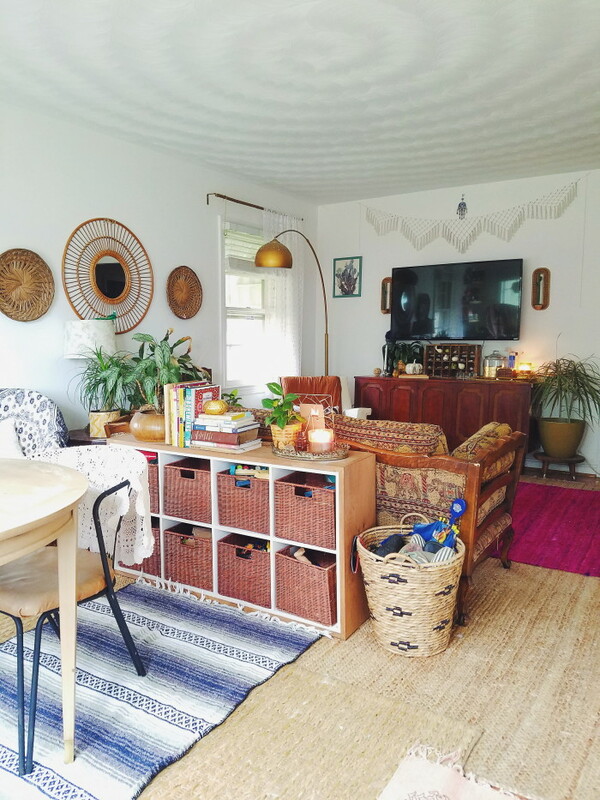 Last time I did a home tour, I think we had finally pared the number of purposes for this room down to entry way, living, and play space. But then a whole slew of discombobulation started. And it's back to being the everything space. The space is divided into a family gathering/playing/TV watching space and an eating, chatting, working space. 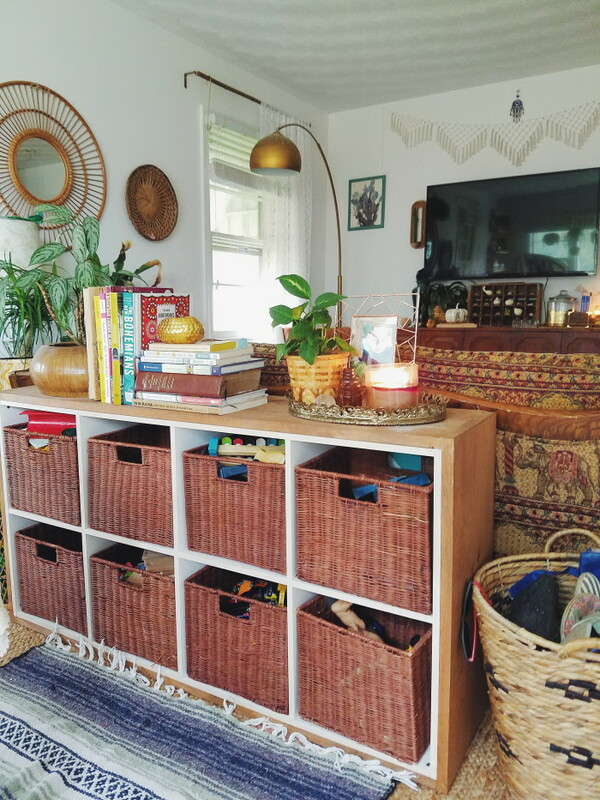 There's a basket for shoes to get kicked off into and a cube divided storage unit full of regularly played with toys and a surface for placing keys onto. 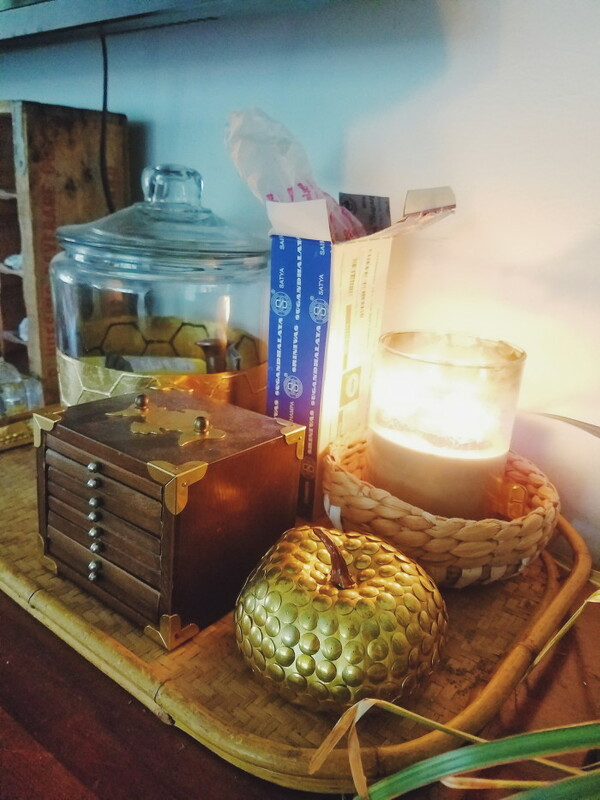 My nod to the season here is the candle you've mentally (or literally 😉) lit as you walked in and a small foam pumpkin I pressed brass thumbtacks into for a bit of bling. Looking back into the space you've just stepped into, you'll see all of the impromptu dining space I pulled together temporarily. The former dining space and a bedroom are getting flipped. I'll pop in and explain all of that better next week. Eating right beside such a bright window is really nice. 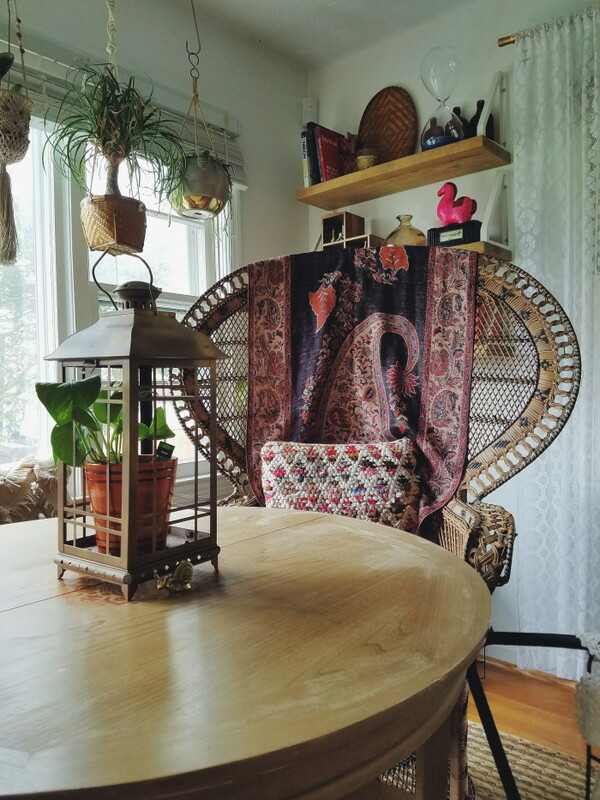 I pulled in my Craigslist world market bench, peacock fanback chair, small round dining table with brass capped feet, and one of the chairs I had to rebuild a seat for. 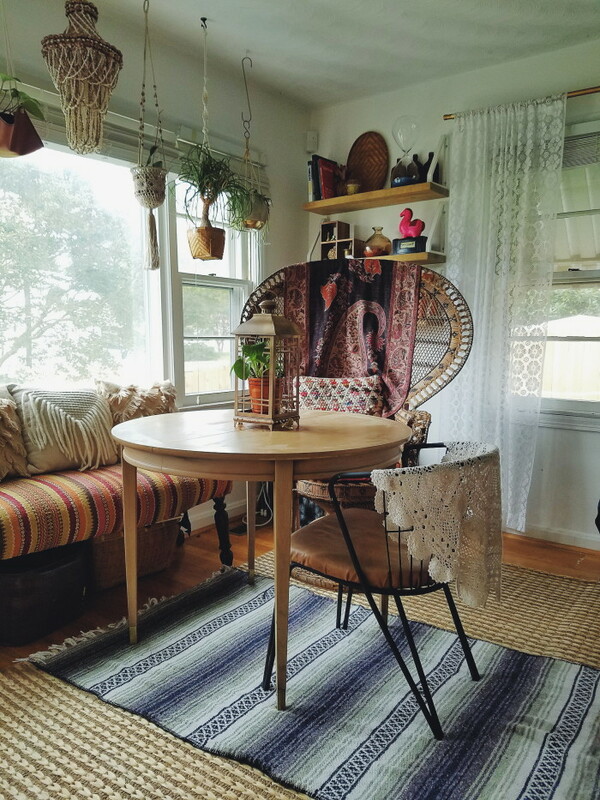 Beneath sits a woven hemp rug and a Mexican blanket layered for that cozy feeling. A simple centerpiece works best for our family. It leaves us plenty of space to sit down and have some tea while we catch up. I achieved that neat finish on the lantern with hammered finish copper spray paint with bursts of random gold over the entire lantern. I feel like it adds just the perfect touch of rustic warmth. I even swapped out my usual tea or navy scarf of the back of the peacock chair for a piece with deeper, richer colors. As we sit and enjoy our tea, you can let your eyes wander. I've carefully chosen and placed every item because I want your eyes to enjoy their visit. 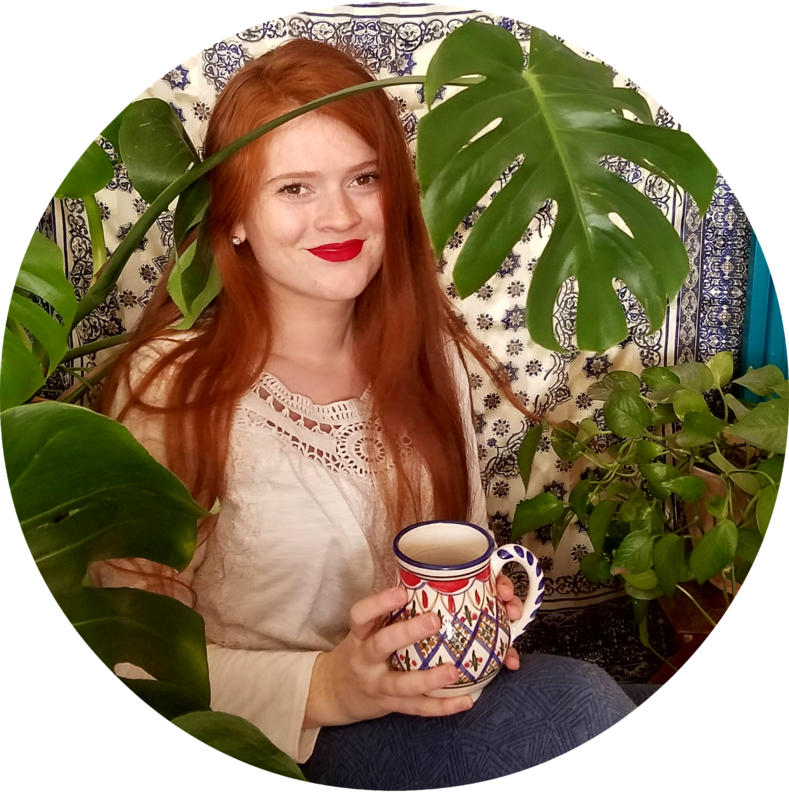 I like my guests to wonder and ask about the stories, feel refreshed with all the greenery, and at home with all the layers. I'll invite you to take a load off and relax on the couch with me. By now you've probably started to notice a faint secondary smell. Incense. From the other end of the house is a stick of nag champa burning. The two smells blend into a deep, complicated cinnamon, woodsy, earthy kind of smell. 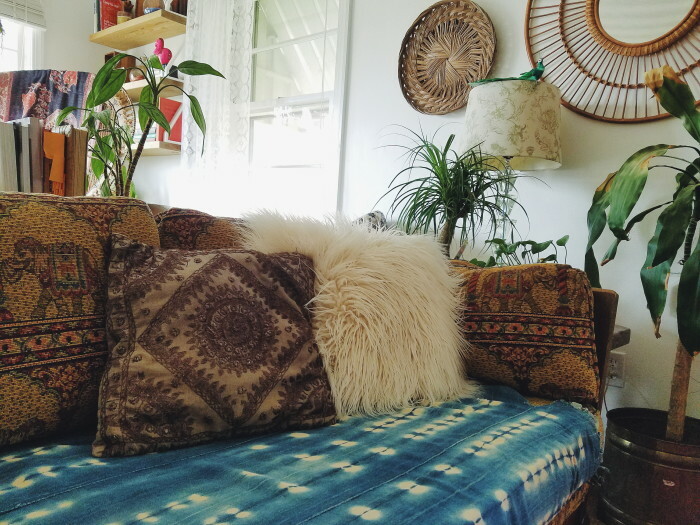 In this space, I swapped out some cooler toned textiles for darker, warmer ones. The mid century swivel rocker got wrapped with a bit of rusty orange fabric and topped with this cute marble pillow. You may start to notice as your eyes wander that there are little pumpkins and gourds spread about. I nod to you Fall. Thank you for your pumpkins and pretty colored leaves. 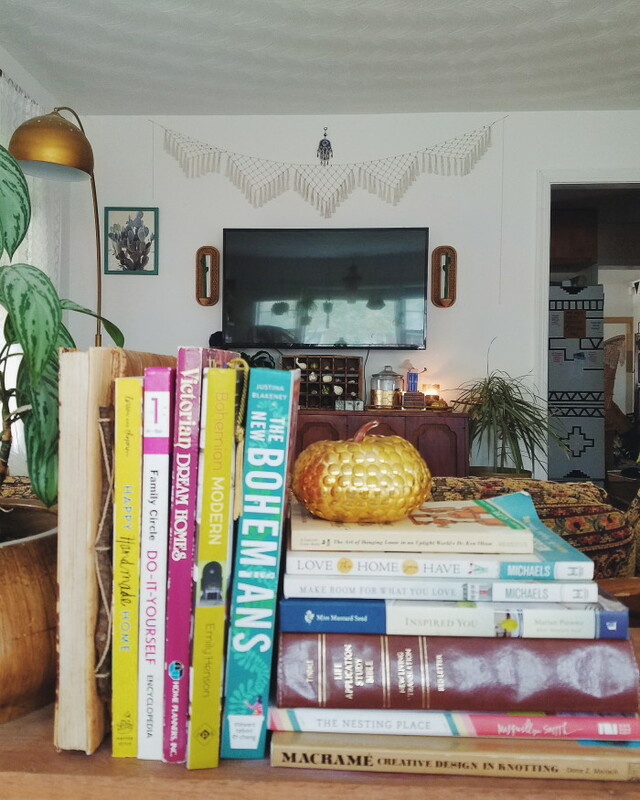 We chat, play pentominoes, watch movies, listen to music and flip through one of my many favorites books to refuel our creativity and spirits here. My solution for a fireplace-less home? Lots of candles. I can almost convince myself the room is warmer when they're lit. I know it's all in my head but I enjoy it nonetheless. I filled in the gaps of my soda crate rock collection display with more foam gourds. I like to keep the bulk of my decor the same year round. I don't normally overhaul a whole mantle, bar cart or shelves. But I do like to add in fun little surprises. A bit of fun pom pom garland for added texture, a metallic pumpkin in line with my usual trio of bells, and a DIY mercury glass pumpkin in place of the usual brass trunk. If you haven't yet been there today, make sure you go visit Alice from Thoughts From Alice. 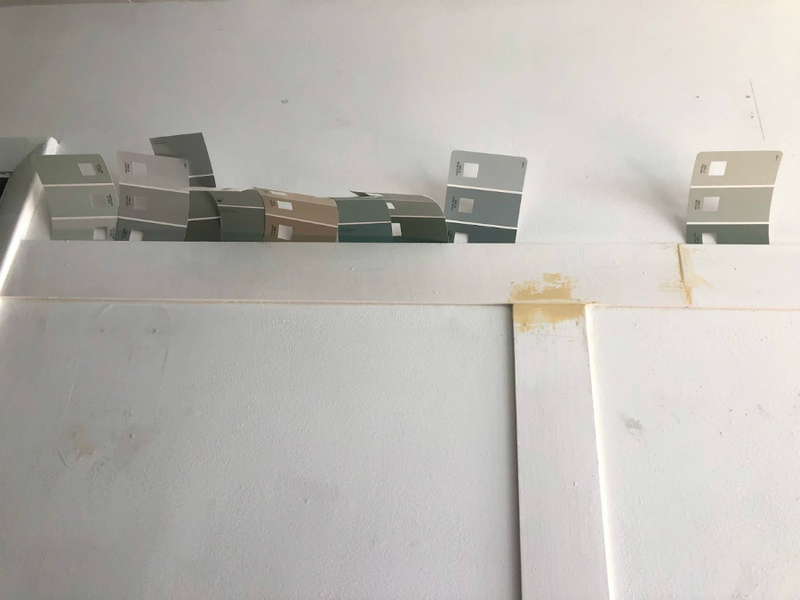 She's got a beautiful aesthetic with her use of colors and finishes to set the mood for a seasonal space. 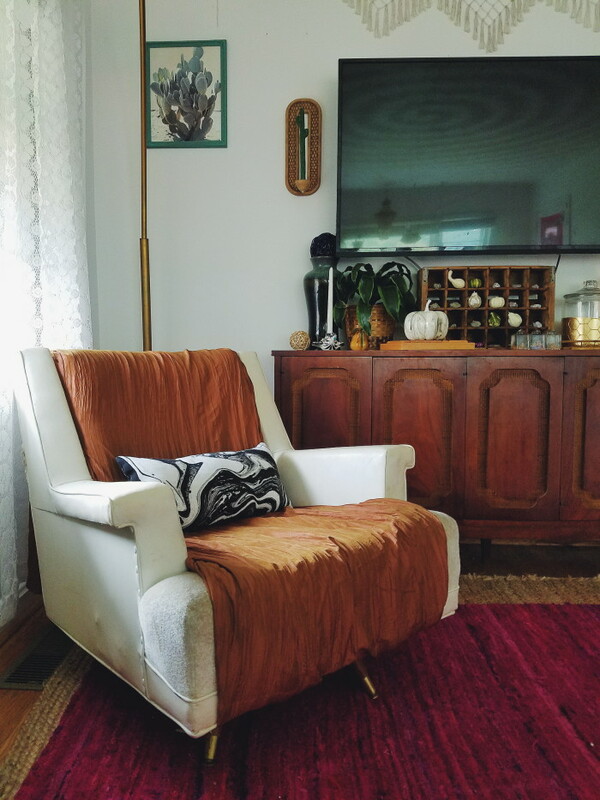 Check out her Fall Home Tour here. And please, don't mind the paint all over the front porch and sidewalk. I would have preferred the opportunity to share my simply Fall decorated front porch. But alas the sweet 4 year old who's been talking my ear off these days put paint all over it all while I prepped lunch 2 days ago. Next time I'll have a proper porch to share! that dining nook you created is so lovely! the mixed seating is perfect. i also really love that garland over the tv- it's so pretty! can't wait to see the changes. I loved this tour, Corinna! Wish I could stop by for a chat and some tea in real life! 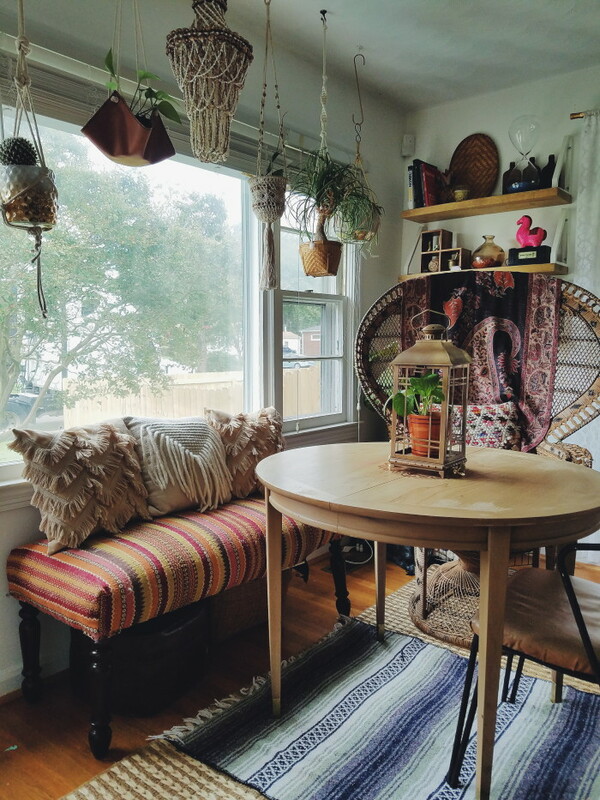 You've done an amazing job in your "everything room" - it feels so welcoming and cozy! I love how you carved out that dining space, especially as a temporary solution (but it looks like it belongs there!) 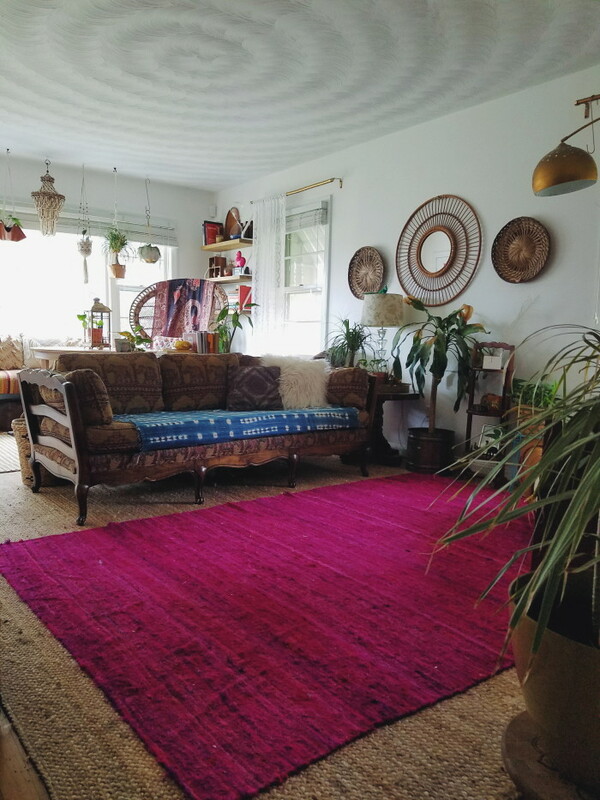 How do you like your natural fiber rugs in the living room? I've been thinking of getting one but am worried it won't be soft enough.